Do you have a simple, heartfelt sentiment to share with someone and you need to say it with meaning, quality and beauty? 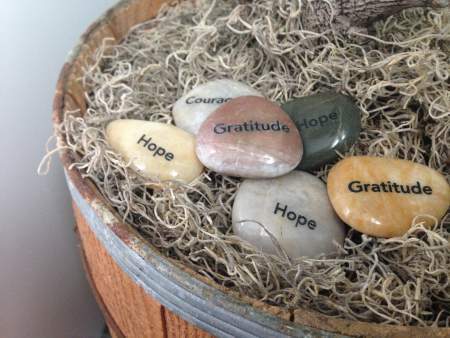 These natural river stones feature words like “Believe,” “Courage,” “Gratitude,” “Peace” and “Remember”—all popular statements, yet incredibly personal sentiments that can be kept close at all times. Averaging about 1 to 2 inches, these polished or glass stones come in mixed colors and with black engraving or print. The words on engraved stones are durable, so they’re perfect for carrying in a pocket or purse, while print stones are ideal for display. We keep these stones in stock and they are ready to ship within one business day. Buying in bulk means you can share them with several people at once, fast. If you need specific words or color combinations, please see our other, more customizable categories.